Below is my column in today’s Guardian newspaper — a further discussion of my proposal to expand the Supreme Court. While overlapping a bit with the column on Sunday in the Washington Post, the piece adds a few new details on the proposal that I first made over ten years ago. Once again, many important decisions were the result of a court of one – 5-4 decisions, with “swing Justice” Anthony Kennedy deciding the issue for the nation. Healthcare is just one of a litany of cases that are reshaping the country in an image dictated often by just five members of the court. This has included sweeping changes in the political process from the Bush v Gore decision in 2000 (where the supreme court effectively chose the next president), to the Citizen’s United case (where the court struck down campaign finance limits for corporations). The constitution itself does not specify the number of justices, and that number has actually fluctuated through the years. The nine-member court is a product not of some profound debate or study, but of pure happenstance. In fact, when the court first convened in 1790 in New York, at the Royal Exchange Building, it had six members. After that time, the size of the court expanded and shrank – largely with the number of federal circuits. Since justices once “rode circuit” and actually sat as judges in lower courts, Congress would add a justice when it added a circuit – or reduce the court with the elimination of a circuit. Thus, when a 10th circuit was added in 1863, a 10th justice was added at the same time. In 1869, the court happened to have nine members for the nine circuits. That is how we ended up with this size of a court. Ever since the supreme court rested at nine members, we have repeatedly had problems of 5-4 splits, with one or two swing justices dictating the outcome of cases. With the increasing longevity of justices, such divisions have become stagnant and bitter. We often find ourselves captive to the idiosyncratic views of a couple of justices’ views on privacy, or federalism, or free speech. The current controversy could not come at a more symbolic moment. This year is the 75th anniversary of the famous “court packing” effort of Franklin Delano Roosevelt. As today, the country in 1937 was in the midst of a profound economic crisis, and Roosevelt was saddled with four conservative justices – known as “the Four Horsemen” – who opposed his New Deal legislation. Roosevelt decided to introduce a bill to allow him to appoint up to six additional justices on the court. The crisis was averted when Roberts voted to support a critical New Deal case and “Horseman” Justice Willis Van Devanter retired – the famous “switch in time that saved nine” moment for the court. Roosevelt, though, may have had the right idea, for the wrong reason. We can certainly debate the optimal number for the court, but we should finally have that debate after over 200 years. I believe a 19-member court would be ideal – roughly the average size of a circuit court. Appellate circuits are often divided between liberal and conservative judges. Yet, it is rare that one or two of those judges are consistently the swing votes on all issues when they sit “en banc” (or as a whole). Just because we settled on nine arbitrarily does not mean that any number is as good as any other. It is not enough to simply retort “why not 29 or 99?” One could just as easily ask “why not three or six?” The point is that we trying to decide on the best size for the court and should be able to look at other models objectively. If Congress ordered the proposed expansion, we’d get to a bench of 19 gradually, with no president allowed to appoint more than two new justices in a term. Once fully staffed, the court would have a more regular turnover. This would allow a broader range of diversity and more consistent opportunity for each president to add members to the court. While a nobel idea & one I think both prudent and rational – sadly we’ll never see those changes in the U.S. for several reasons. Both parties are more concerned with predicting the advantage of change rather than enacting it for reasons that are either rational or prudent. Additionally, I think it (the viability of such change) assigns far too much credit to the electorate – writ large – who increasingly demostrates a willingless to sacrificy democracy for reasons of partisanship. The same electorate who do not realize the constitution is an organic document. I am not optimistic about any change occuring that does not benefit the entrenched plutocracy within our slowly dying democracy. 2. One unitary president — who is also divine — made up of a parent, a child, and a spirit, which are indivisible, but which are made of three parts. In Israel, a tiny country with 6 Million inhabitants the Supreme Court as some 20 Justices and few deputy-justices. The parliament (Knesset) only rubber stamps the selections. Interesting proposal Professor. I don’t think this kind of logic would get through the House. The majority in the House and the Court have no desire to improve the system or the country. Prof. Turley, would you apply the same reasoning to propose a move away from a unitary Presidency? After all, the role has morphed from being little more than Congress’ bellboy into something far more resembling a King. So you want three presidents? Did Justice Antonin Scalia go too far this time? Some say the tone of Justice Scalia’s dissent targeting President Obama and illegal immigrants was too strident and partisan, even for the high court’s longtime conservative firebrand. Now who is gonna complain you pissed in the oatmeal today…….. This is the most damning indictment of the SCOTUS I’ve read. The reality is that the 99% have been out doing 99% life while the 1% have been out doing 1% life. So, that is not working out so well, so we now contemplate a BIGGER 1%, or a BETTER 1% … or a BIGGER 99% or a BETTER 99%? Let’s face it, the U.S.eh? is a mispronunciation. Bigger is not always better, and in today’s bully worshiping world, it would be worse. So, let me focus on BETTER. The Supreme Court will become better as the nation becomes better, worse as the nation becomes worse. 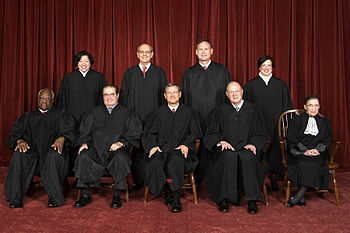 Just to rattle some cages … what if the U.N. was allowed to add three justices to every supreme court in every nation? I would add the suggestion (apparently from Glenn Reynolds, but I doubt if it originated with him) that by expanding the court, we could much more easily add noted doctors, scientists, engineers, businessmen to the court. BTW, is it just me or there recently has been a lot of prominent Americans writing important pieces in The Guardian but not in US news media?